Many associations between organisms, both intra-and interspecific, can be usefully regarded as 'producer/scrounger' (P/S) relationships. One or more individuals or species (scroungers) within the association in some way use the behavioural or physiological investment of others (pro- ducers) to reduce their costs of obtaining a limited resource. Examples are legion: many parasites take up more or less permanent residence in or on a host individual and use the host's ingestive, digestive or circu- latory processes to reduce their own feeding costs; pirate (ldepto- parasitic) individuals or species exploit the foraging investment of 'host' individuals/species by stealing procured food; inter- and intraspecific brood parasites exploit the nest-building behaviour and parental care of other species/individuals; non-displaying 'satellite' males may usurp matings (ldeptogamy) from higher ranking males whose display effort has attracted females to a courtship gathering, and so on. Scroungers appear to reduce the costs of exploiting a resource by letting producers invest the necessary time and energy in foraging, building, incubating, displaying, defending, evolving anti-predator adaptations, etc. , and then usurping the results of their efforts. 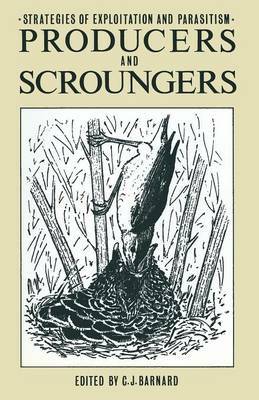 The utility of scrounging, however, is conditional on a number of factors including the availability of producers, the number of scroungers exploiting them, the cost of scrounging in terms of producer avoidance, defence and/or retaliation, the value of the limited resource and the scope for alternative strategies of resource exploitation. This book brings together theoretical and empirical studies of PIS relationships in a wide variety of contexts and species.